Stomoxys calcitrans is presently distributed worldwide, and was introduced into North America from Europe during the 1700's. 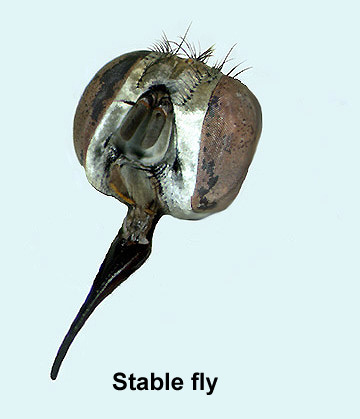 Stable flies bite livestock, domestic animals and man, but unlike horn flies remain on their hosts only when attempting to feed. 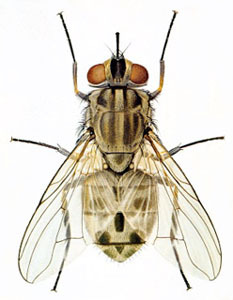 Adults average about 8 mm long and are about the size of a large housefly. They are gray in colour with 4 dark stripes on the thorax and several dark spots on the top of the abdomen [fig.]. Like the horn fly the mouthparts are visibly extended forwards from the head as a long slender piercing proboscis. However, the palps are much shorter, less than 1/3 the length of the proboscis [fig.]. Eggs are without a terminal respiratory horn as seen in the face fly [fig.]. Larvae are yellowish white maggots about 5 - 12 mm long. They are cylindrical and taper anteriorly. Two subtriangular shaped spiracles are located on the rear end. The spiracles are widely separated by a distance of approximately 1.5 times the width of one spiracle. Each spiracle is dark with 3 S-shaped slits surrounding a central button [fig.]. Puparia are reddish to dark brown and 4 - 7 mm long. The respiratory horns found along the posterior border of the 4th segment are small but visible, and are darkened basally. The posterior spiracles are shiny black with 3 S-shaped yellow slits; the spiracles are subtriangular in shape and are separated from each other by a distance of about 1.5 times the width of one spiracle [fig.]. Stable flies are common around confined animal rearing facilities, but can also be pests in open pastures. Both sexes feed on the blood of livestock and man, and inflict painful bites. Adults actively feed during sunny days and generally feed on the lower parts of animals. After feeding, they rest in the shade of posts or trees, and on the sides of buildings. Females require blood meals for egg production and can lay several hundred eggs during their lifespan. Eggs tend to be laid in moist decaying organic material that contains large amounts of rotting vegetation, such as manure mixed with bedding, fermenting feed, silage, and rotting hay. Larvae complete development and pass through 3 instars within 1 to 2 weeks. They spend a further 1 to 2 weeks as puparia before emerging as adults. The entire life life cycle from egg to adult is usually completed within 2 to 5 weeks, with a number of generations occurring throughout the summer. Stable flies overwinter in breeding sites as puparia and emerge the next spring as adults. Blood feeding on cattle by even a few stable flies causes irritation and obvious annoyance. Cattle become restless and spend less time grazing, resulting in lower weight gains and milk yields. Current management practices primarily involve waste sanitation, pesticide application and biological control methods.